Implant Dentist Rancho Bernardo | Why is Flossing so Important? 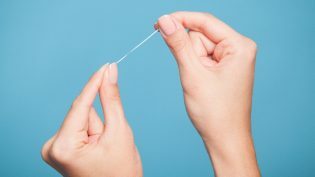 Classic Dental Smiles > Classic Dental Smiles Blog > General Dentistry > Rancho Bernardo Dentist | WHY IS FLOSSING SO IMPORTANT? It may seem like brushing alone is enough to clean your teeth, mouth, and to help you maintain your oral health, yet this is not always the case. When you skip flossing, you are allowing harmful bacteria to grow in the hard to reach places in between teeth and gums that your toothbrush cannot reach. It is recommended to floss at least once a day to help clear away food particles and bacteria before they cause any damage, however, many people don’t take the time to floss or to do it correctly. Cleaner mouth – By not flossing, you are cleaning only two thirds of your tooth. When you brush and floss daily, you will clear away most of the plaque that sticks to your teeth and prevent several issues such as gum disease, tooth decay, and chronic bad breath. Prevent gum disease – When plaque isn’t removed it can calcify and become tartar, which cannot be removed by brushing and flossing. Once this tartar works its way between your teeth and gums, it can cause a chain reaction leading to receding gums, bone and eventual tooth loss. Healthier body – There is a link between your dental health and general health. Those with dental concerns such as gum disease, can also experience several general health concerns as a result. When the bacteria in your mouth isn’t removed regularly, it can lead to heart disease and diabetes but by flossing regularly, you can reduce your chances of developing these and other inflammatory diseases. Beautiful smile – Once gum disease has progressed to periodontal disease, it can start to eat away at the gum line and the underlying bone. Gum recession can make your teeth appear longer than normal and lead to unsightly gaps in between your teeth. Severe bone loss can also cause you to lose teeth and change the shape of your jaw and face. When you brush twice a day, floss at least once a day, and see your dentist regularly, you can avoid irreversible damage to your teeth and gums. If you live in the Rancho Bernardo, CA area and would like more information about the importance of flossing, and how to do it correctly, please contact Dr. Brian Chan and his team at Classic Dental Smiles today!